Chalet Dominique boasts a fantastic location in the centre of Morzine. The Pleney slopes and telecabine are less than 100 metres away and all the shops bars and restaurants are just around the corner. 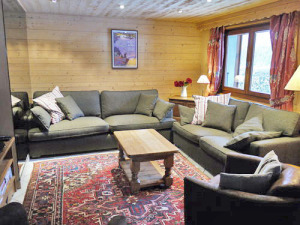 The chalet has a traditional alpine feel and is very well equipped with everything you need. The chalet`s living and sleeping accommodation is shared between the two main floors of the chalet and a studio apartment on the lower ground floor. The dining area is spacious and warm with an open fire adding to the cosy feel. The sitting area has plenty of comfy seating and is equipped with TV, DVDs, a docking station, some books and a few board games to keep everyone entertained. A small quiet reading area or breakfast room with a small dining table completes the living accommodation. The kitchen is well equipped and large enough to make meal preparation a pleasure. A WC is located in the hallway leading to the garage. Upstairs are four bedrooms, a bathroom, a shower room and a WC. The bedrooms on this floor comprise of three doubles (one of these can also be a twin) and a bunk room which is great for children. The studio apartment completes the sleeping accommodation and provides a quiet haven from the rest of the chalet. The apartment has a double bed (can also be a twin) and a single bed, a shower room, WC and a small kitchenette. The garage is an ideal storage area for bikes/skis and also houses a washing machine. Alptitude Chalets have a small store cupboard which is occasionally accessed through a back door in the garage. There are two/three parking spaces in front of the garage for guest cars.